Sewing can be the best of times and the worst of times. Whether you're coming to the triumphant finish of a long, arduous project or screaming in frustration after another lost bobbin, your sewing machine has been with you through it all. Give a little love back with one of these amazing 10 Tutorials for How to Make a Sewing Machine Cover. Every DIY sewing machine cover in this list will make a gorgeous, functional cover to keep your machine safe from dust and grime. Even better, these are all easy projects perfect for beginners and experienced sewists who are short on time. Plus, a cover like one of these makes a wonderful gift for your fellow crafters (or a well-earned reward for yourself). 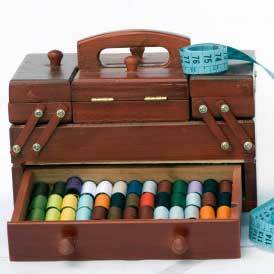 Protect your sewing machine and give a little decorative touch to your sewing room at the same time. For an exclusive full tutorial that you can print straight from our site, check out How to Make a Sewing Machine Cover. This adorable DIY cozy protects your machine from everyday wear and tear while providing a cute, creative way to store your scissors! This pattern is incredibly easy to make and will add a splash of fun to any sewing room decor. This is one of those DIY sewing projects that is as sentimental as it is beautiful. This cover is so elegant and brings a classic, old-fashioned touch to all your projects. The great thing about this easy sewing project is how customizable it is! This DIY cozy takes no time at all to make and can be customized to suit any personality or color scheme. You only need two pattern pieces to follow this sewing machine cover tutorial! The design is so simple and pretty, you'll be hesitant to take it off before starting a new project. Get a 2-for-1 deal with this reversible cover! Have a great cozy for both rain and shine with this impossible easy, reversible design. Use your sewing machine to make a project for your sewing machine with this adorable pattern. This sewing machine cover is perfect for practicing your quilting skills—and for using up scraps! This sewing machine cover is so striking. The pattern calls for a combination of quilted patchwork and geometric lines that creates a gorgeous look you'll want to show off to the whole house. Make two covers in the time it takes to whip up one! This sewing machine cover is absurdly easy to put together and offers you a choice every time you use it. This pattern features a floral pattern on the front to add some extra cute to your sewing room. If you're searching for sewing room ideas that are pretty as well as functional, this is the tutorial for you. This can be created from any fabric. It takes no time at all and is super cute. This would make a great gift for a crafting friend or a fun afternoon project to create for your own machine. This pattern mixes simple sewing with fun embroidery to create a sewing machine cover that's playful and functional. This DIY sewing machine cover also doubles as an organizer for your sewing room, and has side pockets that are perfect for holding your scissors, seam ripper, and measuring tape. This can help your machine stay free of all that extra dust and grime. If you are a quilter looking for a great way to cover your machine, create this cutie. This tutorial will teach you how to make a sewing machine cover that will keep your machine clean and in good working order. It is practical and functional, but it also adds beauty to your sewing area. The number one way you can keep your sewing machine spick and span is to put a cover on it. With so many nooks and crannies, dust can be the death of an otherwise perfect machine. Bingo! My machine came with a cheap, thin type of plastic bag/cover thing. The sewing machine shop suggested I don't use it because in hot weather condensation will form inside the cover and wet the machine. Result is the machine is always dusty. Thank you for showing me that I need to make one of these covers and solve the problem. Not only are these functional but they are all so cute! HOW have I never thought of this before? No wonder my machine is always dusty. Thanks, AFS! Put a pillowcase over it! Done! Put a pillow-case over it.